I greatly enjoy capturing a beloved pet in an original painting its owners can enjoy forever. 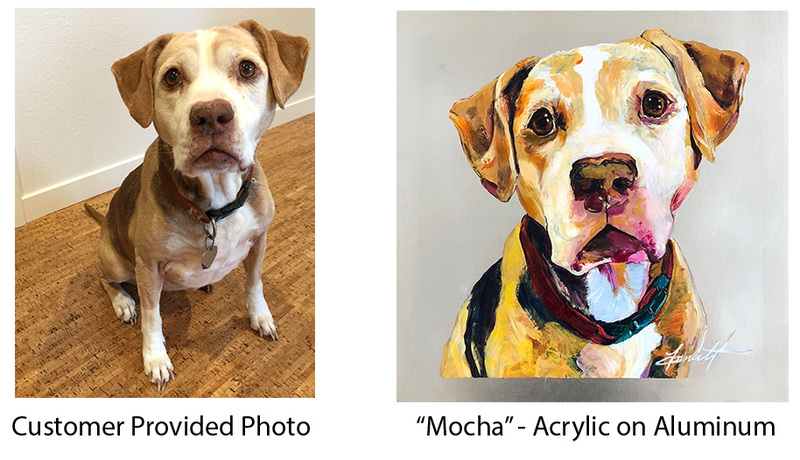 I know from experience that a pet’s life is much too short but their love lasts a lifetime and these portraits help to memorialize their gifts to us. A pet portrait will show their personality and likeness. Perhaps you want to include a special toy, setting, or have your dog painted in a sweater vest. Whatever it is, I promise it will be a conversation piece, remind you of good memories, or just put a smile on your face. Also, did I mention these make great gifts?! Below you will find information regarding pricing, styles and sizing but to best answer your questions, fill out the order form below. If you have any questions along the way, don’t hesitate to ask! The order form is helpful in showing me what your pet looks like, style, size and budget include. Once I receive your order form I will be in touch! Additional samples of work are on the Original Paintings Page. OPTION 1 - Acrylic on Aluminum: These portraits are multi-chromatic and do not include a background. The play of light between the paint and the aluminum background gains interest and gives the spotlight to your pet. OPTION 2 - Oil on Linen Canvas: This is a great style to choose if you are looking to add a specific setting or theme. For example, put your pet in a suit and tie, or combine a special place or toy. This style is usually true to its photograph unless there are other elements you want to add. Undecided, need to talk to you more about it. Are you interested in framing for this painting? Yes! Please talk to me about framing prices and options. Please brag about your pet here including their name, breed, personality, likes, etc... go! 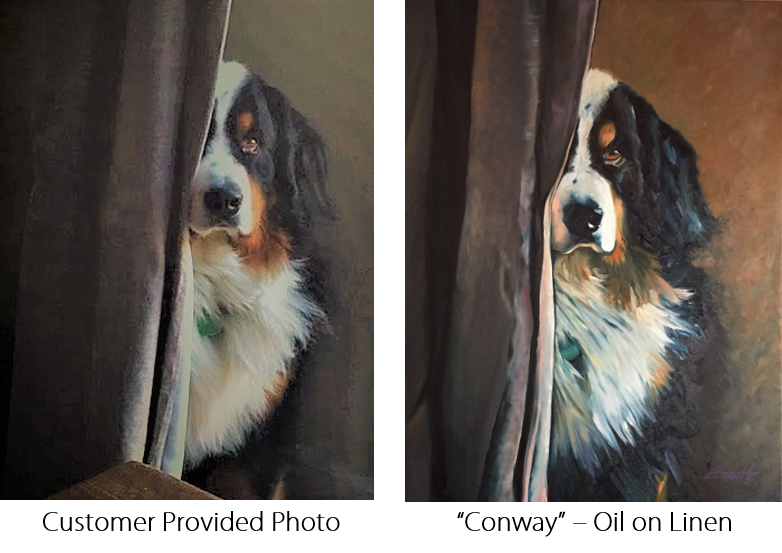 Adjustments can be made for shadows or poor lighting, however, better pet photos usually translate into superior pet portrait paintings. Subjects, features or backgrounds can be combined or omitted from separate photographs as required to achieve desired result. 1. Shoot from pet's eye level or below by sitting on the floor or lying on your belly. Try NOT to take the photo from above your pet as such photos are often disappointing. 2. Use natural lighting either outside or indoors by the light of a nearby window & avoid flash. 3. Get close to your pet and focus on their eyes. 4. Be patient. Have someone attract your pet's attention behind you while you shoot or hold a treat in your hand close to the camera. Try making a high pitched tone or whistle to get them in an alert pose. 5. Stay away from filters if possible. I want to make sure to get your pet's unique coloring just right! If the upload is not working you may email them to annahileman@gmail.com. Is this painting a surprise gift for another animal lover? If so let me know. I love making someone else's day! Gift Cards also available! Do you need the painting by a specific date? Any Questions? Anything I may have missed? DISCLAIMER: You are NOT required to pay if you are not satisfied with this painting. Your satisfaction is more important to me than your money.